These Westinghouse radios are known among collectors as the "Refrigerator" because of the unusual and interesting appearance. The cabinet design was aimed towards portability and resulted in a vertically oriented 6-tube AA6 (All American 6) chassis that stood on its narrow side. There is a single screw in the center on both sides for easy removal to replace the tubes or to perform technical repairs, which is quite convenient! 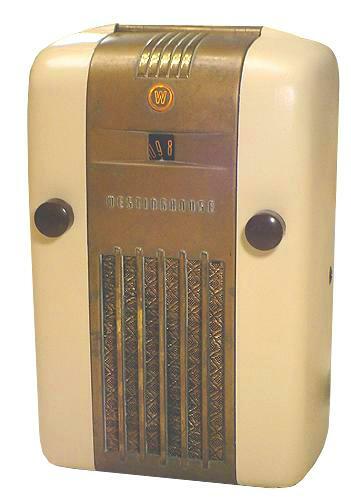 When I was given this radio by a friend, the beige-white bakelite sides needed repainting. All of the tubes had the original Westinghouse brand, which indicates that perhaps the radio was not used too much. However, two of the tubes had bad filaments and had to be replaced. After replacing all the capacitors, the radio plays splendidly.